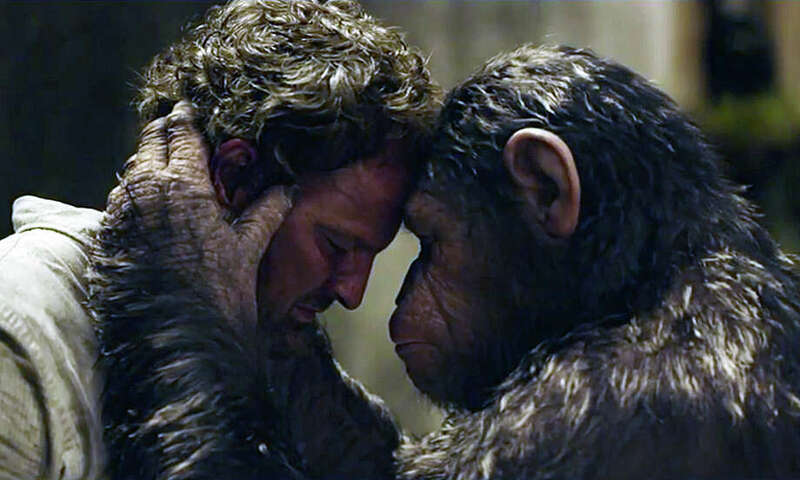 Human-simian interaction in the new movie, "Dawn of the Planet of the Apes." Our film critic, Susan Granger, offers her review. Set 10 years after "Rise of the Planet of the Apes" (2011), this sci-fi adventure takes place in California's Bay Area, where genetically enhanced, now-mature Cesar (Andy Serkis) is living in a thatched village with his mate (Judy Greer), who has just given birth, and their older son (Nick Thurston). Statesmanlike, Cesar has established a primitive, familial society, governed by strict cultural rules, like "Ape no kill ape," taught by the wise orangutan Maurice (Karin Konoval). Problem is: in post-apocalyptic San Francisco, humans are struggling to survive under the leadership of Dreyfus (Gary Oldman) after a global flu pandemic. When an engineer, Malcolm (Jason Clarke), his teenage son (Kobi Smit-McPhee) and doctor wife (Keri Russell) try to reach an old dam to tap into its desperately needed hydro-electric power, they unwittingly venture into Cesar's home territory. While Malcolm tries diplomatically to establish peaceful contact, one of his cohorts is trigger happy, which infuriates Koba (Toby Kebbell), a chimp who still carries the physical and emotional scars of laboratory cruelty. So a full-scale war seems inevitable. Scripted by Mark Bombeck, Rick Jaffa and Amanda Silver, it's directed by Matt Reeves ("Cloverfield") as a mythic morality tale, tackling themes of loyalty, trust and co-existence. Embodying intellectually enhanced Cesar and redefining acting in the digital age, Serkis ("Lord of the Rings") is the acknowledged master of motion-capture technology. Before production began, Serkis and the approximately 50 other actors who portray simians, worked in the woods of Vancouver, British Columbia, for three weeks to establish how they would move and communicate with each other, using grunts and sign language. Then Weta Digital recorded their facial expressions and movements, feeding the information into a computer that generates their remarkably lifelike simian characters. Contrast that with Charlton Heston's "Planet of the Apes" (1968), in which apes were portrayed by actors in costumes and masks. On the Granger Movie Gauge of 1 to 10, "Dawn of the Planet of the Apes" is a visually dazzling, tension-filled 10 -- with a third installment set for July 2016.